OXFORD, Ohio – Friday’s game can be summed up in two themes. One, Miami was unable to capitalize on its ample scoring chances. Two, Minnesota-Duluth netted devastating, timely goals right after RedHawks surges to kill their momentum. The final result: A 3-1 Bulldogs win over Miami at Cady Arena in the series opener. The RedHawks hit four posts, missed multiple additional A-plus chances from in close and finished with 29 shots on goal in addition to those that drew iron. Hunter Shepard, the No. 14 Bulldogs’ goalie who stopped 28 shots and played exceptionally, turned three SOG aside during a Miami power play, during which the RedHawks seemed to have the puck deep in their offensive zone for the duration. Sixty-one seconds after that man-advantage ended, Miami was picking it out of its own net. Then came Glassgate, when a pane of glass in the corner of the rink shattered and needed to be replaced. A UMD goal and a 15-minute delay later, any momentum the RedHawks still had was long gone. That was late in a first period that saw Miami dominate, 11-4 on the shot counter (although the Bulldogs’ first two shots in the opening minutes were never counted). Minnesota-Duluth (6-5-2) shut down the RedHawks’ offense in the second period, holding them to three shots. But Miami (4-6-1) controlled play early in the third period, as Carson Meyer tied it on a power play. The majority of play the first three quarters of that final stanza were played in the Bulldogs’ zone. Then MU’s Casey Gilling was whistled for boarding. Then UMD scored. Then UMD scored again. – It’s encouraging that Miami was able to dictate play for large parts of a game against a ranked team. Though the RedHawks need to win a majority of these games, obviously, this was a good litmus test for MU and shows they can compete against ranked teams. Miami is certainly better than Connecticut and swept that series. Dare we say the RedHawks appear stronger than Colorado College although the teams split that set. North Dakota is, well, really good, and MU went 0-1-1 there. Duluth, on the rankings bubble with a lot of its key players from 2016-17 gone but boasting a strong freshman class and a lot of solid returnees? It’s intriguing to see how Miami fares against a team like that. Process still matters, and the RedHawks largely passed that test on Friday, but the end result was obviously not what fans/players/coaches would’ve wanted. – Game time: 2:40. That has to be one of the longest non-overtime contests in some time. – Miami won 37 of 62 faceoffs, or 60 percent. This has been an area of weakness in recent years for the RedHawks, so the turnaround is welcome. Gilling was 11-6, Kiefer Sherwood 11-8 and Josh Melnick 7-6. FORWARDS: D+. Chances are great but Miami needed to score more than one goal. Faceoffs, as mentioned, were a strong suit. Four members of this corps took penalties (Sherwood, Gilling, Ryan Siroky, Conor Lemirande), and the PPG off the Gilling boarding call was devastating (and yes, that was the right call – he had a player lined up and pounded him with the numbers/letters showing). Sherwood turned it over on a clearing chance in the first period, and UMD put it in the net. Melnick had a pass picked on the PK and that ended up being the Bulldogs’ second goal. DEFENSEMEN: B. This is a curious group, with several members appearing to be given the green light to jump into the offensive zone and others not. But it seems to be working, evidenced by a Bulldogs shot total of 19. Louie Belpedio is putting points up, but his defense is way better than last season (not sure how healthy he really was in 2016-17). Scott Dornbrock is also playing at a noticeably higher level, and his positioning is much improved. No opponent around Grant Hutton, whose defensive play is still underrated. Alec Mahalak did throw a puck along the boards on a failed clearing attempt that resulted in UMD’s third goal. GOALTENDING: C-. This seems to be Ryan Larkin’s MO recently: He makes a couple of spectacular saves but allows a goal or two he could’ve stopped. The second UMD shot was a quickly-developing one-timer that he had no chance on, but he got glove on the first shot, which deflected over the goal line, and the third goal seemed to slide under his pads from well outside the top of the faceoff circle. His save percentage for season is still just .880, and this 16 of 19 performance did not help that. LINEUP CHANGES: Up front, Sherwood, a healthy scratch in the North Dakota finale, was back in the lineup. He replaced Zach LaValle, who had played in nine of the first 10. Willie Knierim dressed for the second straight game, as Austin Alger was out for his second consecutive contest. It sounds like Alger may miss some time after suffering an undisclosed upper-body injury. On defense, Rourke Russell was back on the lineup sheet after missing his first game last Saturday. That sent Grant Frederic to the stands after he had played two games in a row. 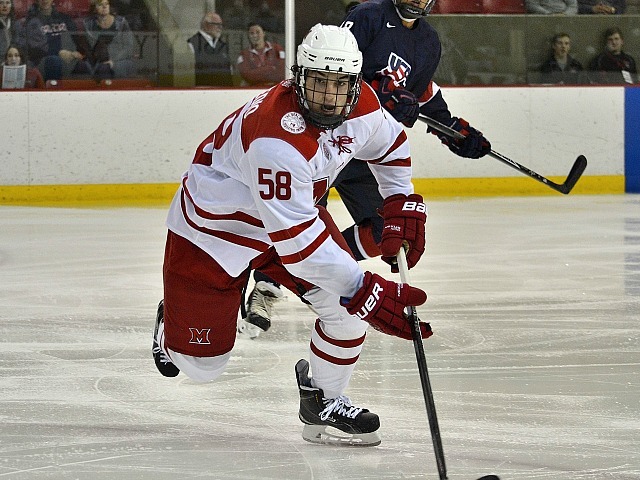 Posted on November 18, 2017, in 2017-18 and tagged 2017-18 miami redhawks analysis, austin alger, grant frederic, kiefer sherwood, Miami RedHawks Hockey, rourke russell, willie knierim. Bookmark the permalink. Leave a comment.